Welcome to our River Restoration Section. Thanks to all the people that made it possible for the projects and work. Without you, what was accomplished over the years would not have happened. Its truly amazing what we have done in the last few years, all the help from volunteers, without who, none of this would have ever gotten off the ground. Thank you again. When we started working on the lower section of country rd. 3 stream it was flowing very slowly, way to slow for a trout stream. 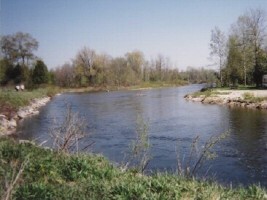 In this section of the stream, the Saugeen river enters the stream behind an island and then both re-enter the main river. While clearing some debris from the stream bed, we found the reminants of an old fence, probably well over 50 years old. We figured that it was used to keep cattle from walking downstream. 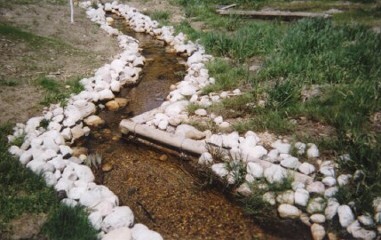 During the years, the fence collected rocks/gravel and impeded the natural flow of the stream. This alowed sand and silt to build up infront of it, all the way up to vortex 5. 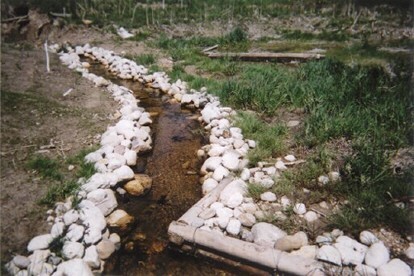 The flow rate was improved significantly once the old fence and surrounding rocks were removed from the stream. You can see the nice v shaped water flow along here now. This flow will get better as time goes on. We’ll let mother nature do the rest now. Nice job. 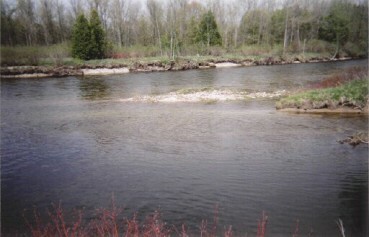 This is where the stream and river re-enter the main Saugeen river. 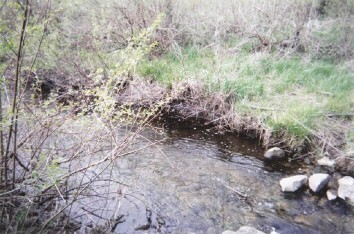 Last year the flow was slow and actually pointed right for the bank on the bottom, eroding this bank a bit downstream. We have found that this has helped with the direction of the river flow and created better trout habitat. Once the stream work was done, at the end of august, we found this area of stream had lots of fry/minnows swimming in it. Upstream from where the stream and the river meet is an area with a extremely high concentration of sand and silt. This has been building up over the years (probably due to the fence). The stream widens from about 4 feet wide to 15 feet wide through this section and the current slows down. 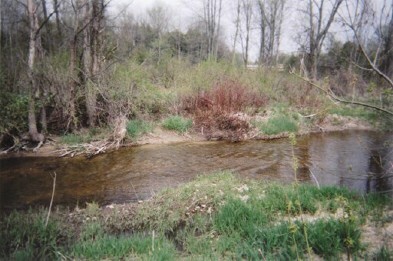 During the summer months (during extreme low flows), the stream water disappears into the sand. 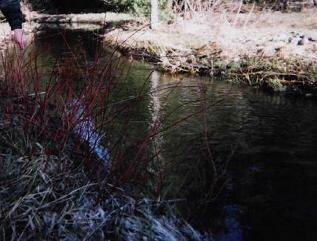 We placed a bumper log across the stream to see what effect this would have. We found out that it dropped the sand about 2 feet around it. We hope to place more in here this summer, and also narrow the stream abit(using rocks along bank), increasing flow rates and washing the sand into the stream naturally. This depends on approval by the Saugeen Conservation Authority of course. During the past few years, we have been planting dogwoods/willow scrubs along the Saugeen River and county rd. 3 stream. We have been learning as we go too..sometimes they work, sometimes they donn’t (washed away by floods, didn’t root properly…) One of our mistakes, was leaving too much exposed above ground (we’re learning). Here are some dogwoods we planted along both sides of county rd. 3 stream. We went back this spring and they are thriving. We plan to do another planting this fall along this stream and also along the river. We will be needing volunteers around late Sept. to early Oct. to help us do more tree/scrub planting. If you have some time available, feel free to contact us. Here is a picture from the park. As you can see, there isn’t much shade/habitat along this side of the bank. We tried planting some willow trees here 2 years ago, but they didn’t take. We plan to try again this fall. The holes are already dug, so we just have to get some willow stumps and bury them abit deeper, with less above ground (as per Ontario Streams manual), and they should take. Sometimes things do work. 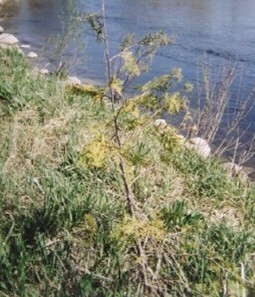 We planted 10 small cedars along this bank in early 2001. We checked their progress this spring, and 8 of the 10 were thriving. It only took 2 of us about 4 hours to get, dig a hole, and plant 10 small trees…not to long considering the benifits to the river. It will take a while till they start producing good trout habitat, but there are trees here now, that wouldn’t be without our intervention…. Here’s a picture of rock vortex 1. 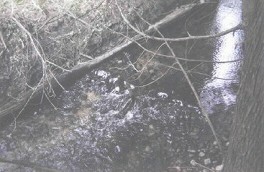 We had noticed that the flow through the stream had degraded over the years and there was alot of silt/sand build up in this section of the stream. Andy Mckee thought that by putting vortexes in the stream it would help clear it up. We then went and met with Gary Senior (SCA) to get a permit for the stream work. He walked the stream with us, suggesting locations for the vortex weirs. He really liked the idea of the vortex weirs and that we were just tweeking the stream. We would also like to thank the landowner, Bob Magwood, for letting us work on his property. Here is rock vortex 3 in the spring this year. You can see the Scotty incubators right behind the vortexes. The vortexes really improved the flow rate of the stream, cleaning alot of the silt out. We also found excellent insect growth (mayflies and caddis), where there had been none before. Here is rock vortex 4. There were some smaller trout sitting downstream from here in the spring. There is now a gravel streambed along here now, where there used it be just silt. We found out that the vortex will pull the silt/sand if front of the vortex and also behind it. This will be very helpful in the future. They also help oxygenate the water during the summer months when oxygen levels are at its lowest. Vortex 5 was a challenge. There was reminants of an old beaver den here. We had to pull alot of roots out of the streambed to find rocks to build the vortex weir. We only used rocks and materials that were in the streambed already. 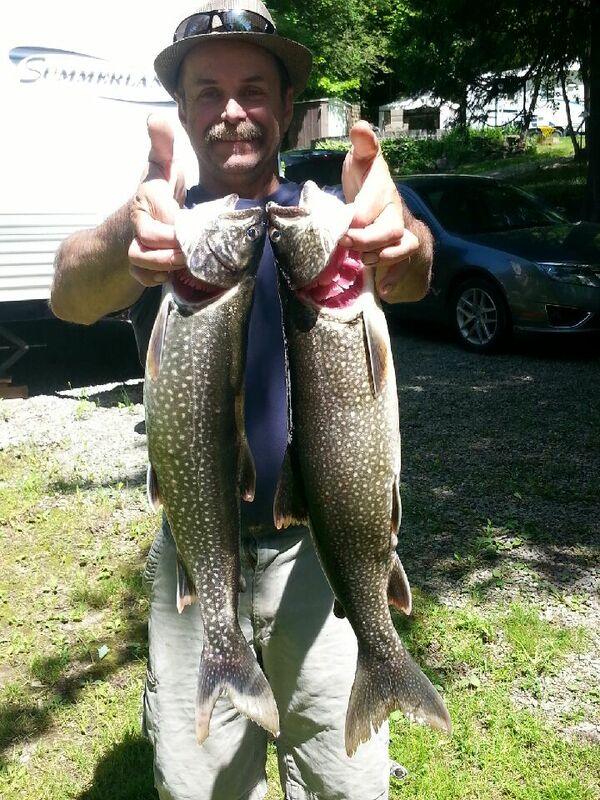 This started flowing alot better due to the vortex….alot better trout habitat. 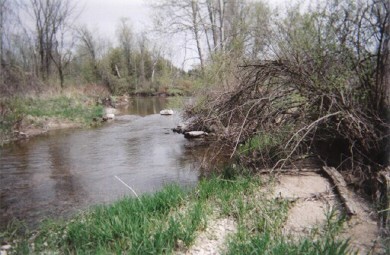 Back in Jan.2001, Andy Mckee (mnr) contacted our club to see if we could help work on a new project in Charron Creek. John Morton (mnr) had designed a plan to do some river restoration along the creek. Back around 1920’s, the landowners (back then) had partially blocked off the stream and made a swimming pool. The storms in the spring of May 2000 destroyed the wall for the swimming pool. When the Charrons bought the property, they wanted to make it a better habitat… returning the stream to a natural habitat that would support brook and brown trout and native birds. 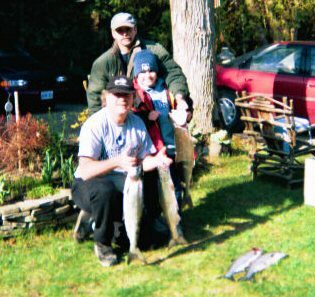 Our club was recontacted by Gary Senior (Saugeen Conservation Authority) in late July 2001 to see if we were available to do some work in the creek. Unfortunately we had alot of work to do in the country rd 3 stream (by the end of aug), however we did meet with all the stakeholders and promised to build an angle deflector and an undercut bank as designed by John Morton. We were able to build both, just in time (all streambed/riverbed work must be completed by the end of Aug. as per SCA permits), and they held through the spring runoff. 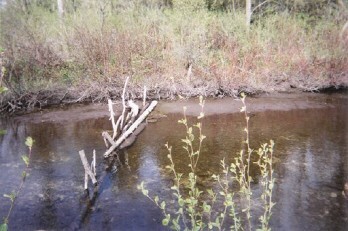 This picture is of the entire channel (taken in May 2002). When this project was started, the creek was ankle in silt and sand and more was washing into the creek daily. You can see by the pictures, that the stones and the angle deflector have stabilized the banks and the undercut bank has made a resting spot for the fish. There is now beautiful spawning gravel along the whole stretch of this stream. Congrats to the beautiful job done by all, especially Mr. and Mrs. Charron. 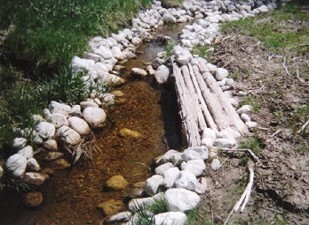 Here’s a picture of the spawning channel. We all began by pulling out some of the bigger rocks and trying to create a nice even current. In the process of lugging out the rocks we came upon several Black Stoneflys of various size (some of them quite large), crayfish and dragonfly larvae (wow, they are ugly…scared the heck out of me…lol). Both of which are good signs of a healthy river system. Would you like to see how it looks years later? This picture was updated in 2013 to show how it now looks. 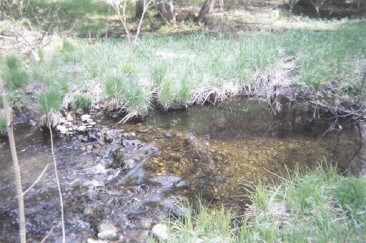 Note the nice flow and the vegetation that has stabilized the banks and create habitat for the trout fry. The second picture is the beautiful spawning gravel in this location. This picture is of the entire channel looking upstream and updated in 2013. . When we started this project the channel was ankle deep and was littered with branches and such big rocks that it was not sutable for our needs. The reason the channel was built in the first place was to give the Scotty incubators a safe place to sit in the spring, when the water levels are the highest and there is much debris floating down the river. We feel that we have achieved this goal; however you can never predict what the river will toss in your direction. We let Mother Nature do the rest. Now spawning sized gravel is now very prevalent throughout the side channel, and flow rates excellent. 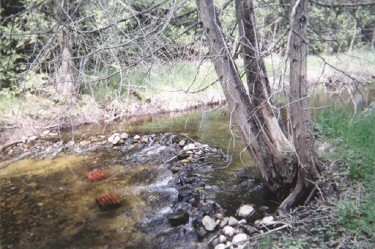 Excellent trout fry habitat created. Andy McKee suggested that we try to straighten out the river behind the island in the park to create better trout habitat. The 1st year we used the backhoe to dig a trench down the middle of the channel. The next year we built a rock deflector that really helped straighten it out and is starting to fill in the bend nicely. We built this by hand…ouch…our sore backs…It held over the spring high flows. 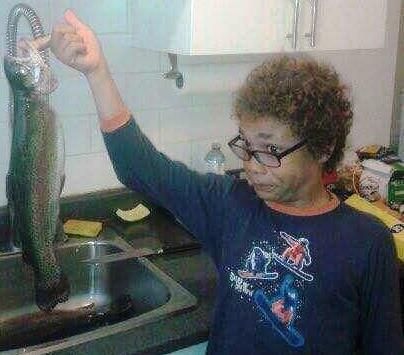 This picture was taken in 2013 to update how it stabilized and it was exactly what we wanted. Now we have a nice straight flow instead of running to the right. As you can see, we have had some good success with regards to these projects. This work would not have been completed without the help of all the volunteers and sponsors, over the years. Thank you for a job well done.